Sea, Sand & Sky: Fishing is actually Fun! This Thursday was the 2016 Fan Pier Fishing Tournament. This was my second time going, and I was excited because I did not go the last year. It was really fun. We got on this nice boat with two professional fishermen. 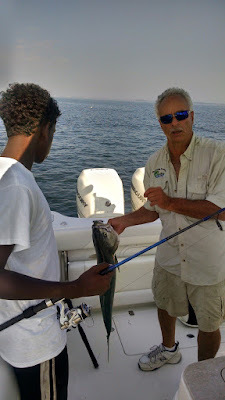 The fun part about it was we actually caught lots of fish. We caught 6-7 huge blue fish. Every time we cast the line,we caught a fish right away. I caught mine on the first cast and it was a blue fish that was 35-40 inches long. Everyone on my team caught one. It was me, Jessie, Sean and Abel. Unfortunately we didn't keep any fish because we got too cocky, and each time we caught something, we threw it back and said that we would keep the next one. But after our 6th fish, we didn't catch anything. Overall, it was a fun day and I enjoyed it. I'm glad I went to the fishing tournament this year.